The North East Business and Innovation Centre (BIC) has appointed Jillian Coleman as centre manager for its newest centre, The Hub in Washington. Jillian, 44 is responsible for the day-to-day management of the new state-of-the-art building, which opened its doors in July this year. The Hub on Crowther Road in Washington is situated in three acres of development land, spread over two floors and consists of 17 modern, air-conditioned offices with a provision for meeting space, conference facilities as well as help and advice to start up and established businesses. The centre has already attracted a number of new tenants and Jillian’s role will involve attracting new tenants, working with existing tenants to develop their businesses and organising key conferences and functions. She will also be responsible for overseeing the management of the busy reception area and two members of staff, Lindsay Capeling and Nicola Johnson, who were appointed in July. Jillian’s background is customer services and events management and she has started her new role after taking a career break for a number of years. She is looking forward to the new challenges this role will bring and said: “This is an exciting time not only for me in my career but also for the development of The Hub. 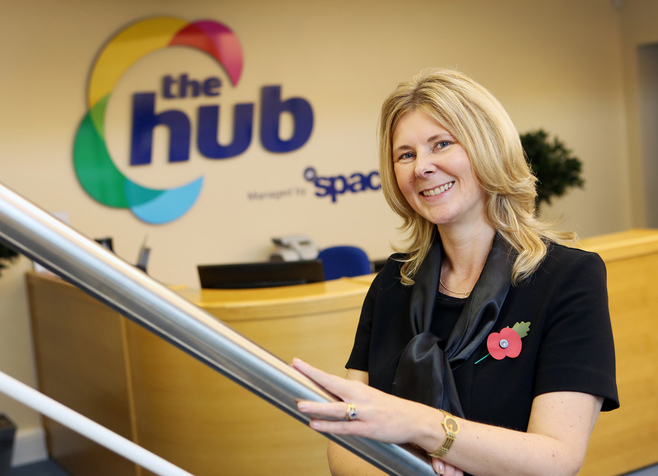 The Hub provides so much more than just flexible managed office space. It is a business community which is starting to thrive and although it’s only three months since we opened our doors, the centre is already almost half full. Paul McEldon, Chief Executive of the BIC, said: “The appointment of a centre manager is another key milestone in the development of The Hub in Washington. Jillian’s excellent communication and management skills are the ideal attributes for this position and we look forward to working and supporting her in this new role. The Hub is in an excellent location, less than two minutes’ drive from the A1 and A19 providing businesses with road access to major regional towns and cities including Gateshead and Newcastle in the North to Durham, Darlington, Newton Aycliffe and further afield in the south. Offices at The Hub range from 150sq.ft. to 1,000sq.ft.